When you think “intern,” do you think “free labor?” Well, not around here. WEPAC is launching an intern program that I hope will be fulfilling for both sides. Of course I look forward to the diversity of thought offered by young active minds, and, to be honest, some help with a variety of tasks. But the program was not launched with that intent, primarily because of how the seeds came to be sown. 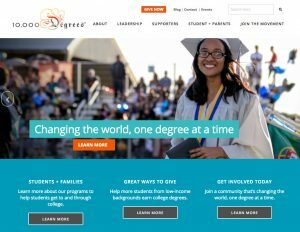 For four years I have been involved with 10,000 Degrees, a program that provides a buffet of support and resources for students from low-income backgrounds to get to and through college (most are the first in their families to go to college). As the volunteer treasurer, I appreciated all my interactions with the bright young people I met through the program, and couldn’t help but feel inspired and fulfilled at the richness of this volunteer work. I looked forward to every opportunity to meet all the fabulous students in the program, hear their stories and then watch them “leave the nest” and go out into the world. I know what you’re thinking: I’ve decided to chuck my business and work for them full time, for free. I know that’s how many “mid-career crises” stories end, but for me, I also find great satisfaction in my consulting work and the company I have built. That’s what got me thinking about how I could combine the two into something meaningful, and the idea for a “different kind” of fulfilling intern program was born. Well, first off the bat, I knew that I had to provide a paid experience. I wasn’t able to find any conclusive data on how many internships are unpaid, but I know the practice is relatively prevalent, and I think it undervalues both the intern and the work that’s being done. So that was non-negotiable. Taking the interns to the State Capitol when our candidates are getting sworn in so they can see the legislative process at work. Swearing-in day is an unforgettable experience, with the Capitol abuzz with the daily work of the government, augmented by the candidates’ friends and families celebrating this momentous achievement. Encouraging them to spend time at the Capitol so they can see firsthand the diversity evident there and realize that this opportunity is not out of reach for someone like them – because there are people just like them, the first in their family to go to college, for example, already serving in the Legislature. Guiding them to develop their own personal thinking by being exposed to a wide range of diverse thoughts. Attending formal political debates and participating in all aspects so they not only get to hear the lively exchange of thoughts but get a hands-on understanding of what goes in to creating an event like that. Immersing themselves in all aspects of our political process. In fact, I want to model it a bit like a successful program offered by 10,000 Degrees, where rising high school sophomores and juniors spend an entire week on a college campus to show the students what college life is like, from the lecture hall to the dining hall and dorm. Benefiting from hands-on experience in the nuts and bolts of the inner workings of an office and how to operate in a professional setting, with practice working collaboratively with a team and interacting with clients. Creating a cohesion among interns where they form a cohort with these other young adults starting in the working world for the first time. The goal is to create relationships (both friends and business contacts) they can rely on when they “graduate” from my internship and go on to do great things. Becoming a voice in the anti-immigration movement, and showing these young adults that not only are they welcome, but they have an opportunity to participate as an outspoken, politically active element of the community. I know a lot of first-generation young people are reticent to vote as there is a fear that they or their families may be at risk so I want to show them that they can safely get involved. Selfishly, I want to have made a dent in the earth when I move on – to know that I might possibly have been a factor in helping these young, mostly first gen students see the possibilities for how government can be a service to them, find their own political voice and the skill and tools to create change in their communities. OK…and now I will step down from my soap box. As you can see, it’s hard for me not to get carried away with emotion and excitement when I consider this fulfilling intern program. And now I have an ask of my colleagues: I am currently looking for a few motivated, engaged students or recent graduates who are contemplating a career in a field such as pre-law, community activism or civil service and are curious about how citizens can contribute to the political process. Do you know someone who might benefit from this internship? I hope you will send them my way!